Beatmaker produces virtual instruments in VST and AU formats, for both Windows and Mac users. The company is offering Atmos 1.0 for free. Atmos is a virtual ambient piano. With a straightforward interface, this rom player is simple but very interesting to explore. The instrument features a sampled Grand Piano recorded from C2 to C9 and then processed with reverb, distortion and delay. From left to right there are Gain and Pan knobs, which are self-explanatory. Then we have LFO R and LFO D knobs, which are LFO Rate and Depth controls. Those controls offer an additional option to shape the ambient piano sound. A Reverb knob will set an extra amount of reverb to add to the sound. Pitch is also self-explanatory. However, a cool improvement to Atmos would be to have an indicator in the Pitch knob, so that the user could be aware of how many up or down semitones are being applied. The FX control adds and extra effect layer, which will make the piano’s ambiance even stronger. Another cool implement would be a midi learn feature for the existing controls. Atmos is a good choice for cinematic and ambient tracks, so it’s worth a try. 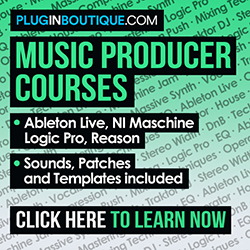 – Compatible with most popular DAWs on the market.